Post written by Malay Sharma, MD, DM, from the Jaswant Rai Specialty Hospital, Meerut, Uttar Pradesh, India. A 28-year-old Indian man presented with acute cholangitis. Transabdominal ultrasonography showed a right-lobe liver cyst and dilated common bile duct (CBD). EUS was performed with a linear echoendoscope before ERCP to ascertain the cause of cholangitis. Linear EUS from the stomach revealed multiple curvilinear, leaflet-shaped, rounded, irregular structures within the dilated CBD and the common hepatic duct. These structures were hyperechoic and multilayered, with intervening anechoic areas without acoustic shadowing, indicating membranous structures folded many times. The structures were floating inside the CBD, suggestive of hydatid membranes. ERCP with biliary sphincterotomy and balloon sweeping resulted in clearance of the CBD with expulsion of multiple bile-stained and whitish hydatid membranes. The patient’s clinical condition improved after ERCP. Follow-up US after 2 weeks revealed a normal CBD and a decrease in size of the liver cyst. Figure 6. 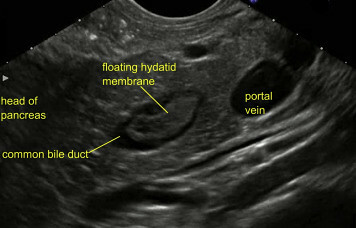 Floating hydatid membrane seen within common bile duct. Hepatic hydatid cyst rupture into the bile ducts (intrabiliary rupture [IBR]) is the most common and serious adverse event of hepatic cystic echinococcosis, occurring in 2% to 42% of cases. The clinical presentations of rupture include fever, right-upper abdominal pain, acute cholangitis, acute pancreatitis (rare), liver abscess, and septicemia. Early diagnosis and treatment of IBR is crucial because mortality is high when obstruction of the biliary ducts occurs, leading to cholangitis and septicemia. IBR can be diagnosed by US, CT, or magnetic resonance imaging in the presence of clinical features of obstructive jaundice or cholangitis. US and CT can demonstrate the place of rupture in 25% to 77% of cases. EUS, by demonstrating the presence of mobile hydatid membranes or cystlike material, may be useful when other imaging modalities are inconclusive or unavailable. Rupture of hydatid cyst into bile duct should be considered in the differential diagnosis of obstructive jaundice and acute cholangitis in tropical regions. The EUS features of hydatid membranes has been described in this video.